The Medieval Tavern is a large historic restaurant situated in the heart of the Old Town in Prague. It lays on the finest medieval banquet in the city. As you enter the Medieval Tavern, the sights and smells transport you back through the ages: Guests are seated at dark wooden tables lit by candlelight. 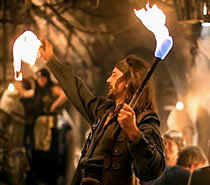 The hustle and bustle of entertainers and scrumptious serving wenches are all around. Above, ropes hang down from thick gnarled beams. A hearty 5 course dinner is included. The cooking is first-class, with portions as large as you like. 1. Classic Medieval. 2. Poultry. 3. Fish. 4. Vegetarian. 5. Vegan. 6. Gluten-free. 7. Children's: menus. On the booking form, state your menu choice(s) in the Special Requests box. If you leave it blank you will be served the Classic Medieval Menu. Unlimited Czech beer, wine and soft drinks are free flowing (the food and drink are always plentiful at the Medieval Tavern!). An extensive historical show plays out all around you, spanning the whole evening. Among the many performers are swordsmen, jugglers and beautiful dancers dressed in costumes from the Middle Ages. Medieval musicians stroll around, and a fortune-teller may reveal your destiny. But beware the executioner on the way out! The Medieval Tavern is in a building dating from the year 1402. Expertly restored, it has a highly authentic feel, but gives a welcome nod to 21st century comforts and hygiene. This ensures a fine experience for everyone. The Medieval Tavern is ideal for groups, as one price covers everything. 5 course dinner + Unlimited beer, wine & soft drinks + Live medieval entertainment.